Primum non nocere – First, do no harm. Day One: It’s really real! As I sit down to write this, the seventh set of Proceedings that I have been a Party to (yes…there’s been yet another one folks!) have come to an end. For only the second time in 3 years and six months – I am not in Proceedings. Indeed, the reason for such a gap between Part One of “How to survive court” and Part Two of the same is because I have needed “time out” afterwards, to recuperate, to repair and to reflect. Having taken a bit of time, I now feel far more able to serve you all better and I hope this next post is useful for any families facing court, and any practitioners looking to understand and empathise better with what a parent goes through during Proceedings. In Part One, I tried to deal with the practicalities of how to navigate your way to the Court, both physically and emotionally. In Part Two, I want to look at the experience of a Court Hearing, what to expect, and how to cope with it in the best way. You will be called, either over a tannoy, or by the Court Clerk, to go into the courtroom itself, often by your case number. Your barrister will know to listen out for it so don’t worry about missing it. It’s a good idea to familiarise yourself with your own number if you can, and actually a good focus when you’re sitting waiting to go in. In my experience, it tends to be two letters at the beginning, followed by a series of numbers and then another letter. It’s a bit like your National Insurance number and if you’ve got a better memory than me, you’ll recognise it on your court paperwork. You may never have been into a Court before and may not know where to sit, or how it might look. 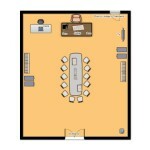 I’ve designed two floor plans (thank you to floorplanner.com) below to hopefully help you to see how it is all set out. You can click on the image to make it larger. I hope. I’m not very good with technology. The first plan is what, in my experience, many courtrooms look like. The Judge sits “on high”, in that their seats are raised up. Some people might feel a bit intimidated by this, but try to think of it as being designed so that the Judge can see everyone in the room clearly. The second floor plan is something I’ve also experienced, and it feels a little less formal. The Judge tends to sit on the same level, and all of the Parties sit around a table. 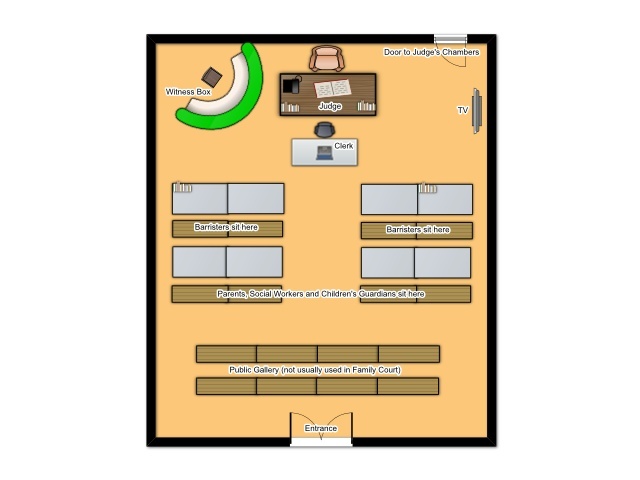 The rooms themselves can be the Judge’s Chambers which are the “Office” of the Judge where he or she can hear certain types of cases instead of in “open court” as in Floorplan 1. How commonly this is done, I don’t know, but I only experienced it in my first set of Proceedings in 2012, and only in the earlier Hearings where there were no witnesses to give evidence. As you can see in Floorplan 1, it is clear where to sit. The solicitors or barristers (also known as “Counsel” – see my Glossary here for more information) sit on the front row, whilst the parents, the Children’s Guardian and the Social Worker(s) sit in the row behind. It may be that there are more “Parties” to Proceedings such as Grandparents, or Aunts/Uncles. They will have their own representation who will sit at the front and everyone else fills the second row with spare seating being used in the public gallery. 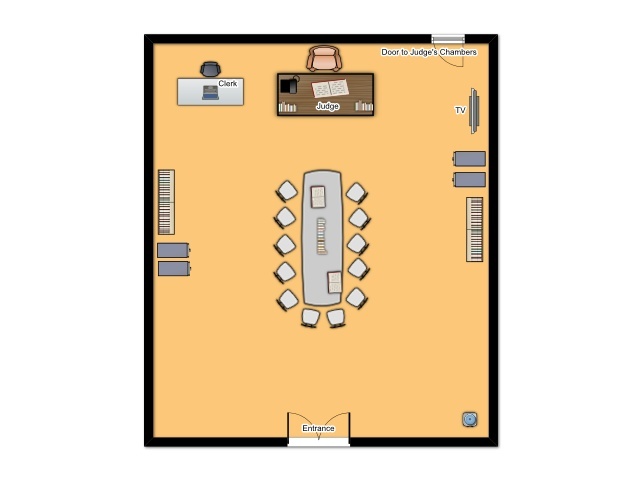 In Floorplan 2, it is less obvious, but if you are presented with this set-up, follow your barrister’s instructions on where to sit. However, in my experience, you sit on the opposite side of the table to the Social Worker. The seats themselves can be nothing more than wooden benches – they are often not the most comfortable of things. That’s why it’s doubly important to wear something you can sit comfortably in for long periods of time. There will almost always be water in jugs on the tables with plastic cups. It’s a good idea to pour yourself a cup whether you’re thirsty or not, before the Judge comes in. Once things get underway, it’s best to try and sit as still as possible and you might well find the anxiety of the occasion may leave your mouth a little drier than normal. It is also a very good idea to take a notebook and a pen into court so you can communicate with your barrister. You cannot speak during a hearing unless directly addressed by the Judge and I personally would avoid whispering to your barrister as it can distract the Judge and the other parties. Writing a quick note if you don’t agree with something (or you want to raise a particular point) and passing it to your barrister is a good way to communicate with them. If your case is heard in open court (as in Floorpan 1), the Clerk will be in the courtroom as you enter, but the Judge will still be in “Chambers”. You are given a few moments to put your bag under the desk, and for the barristers to get their files in order before the Judge will knock on the door from their Chambers to the courtroom. At this point, you must “rise”, or stand up. It is a mark of respect to the Judge and must be observed. The judge will then look to the barristers, give a nod, they will bow their heads back and then everyone can sit down. This might seem a strange thing to do, but it is an etiquette of the court and, to be fair, court is a strange old place to be. Your case will very likely be heard by a District or a Circuit Judge, so check with your barrister which and try to remember the correct way to address them. This is particularly important when you are giving evidence, as it shows respect. As it is the Local Authority who are making the application to the court, they will speak to the Judge first. This is often a very difficult time for the parents; essentially you have to listen to a barrister list the reasons why they think your child or children should be made subject of a Care Order (or whatever Order is being applied for) and – usually – why they should not live with you anymore. I can’t dress this one up in any way – it hurts to hear these things. The opening speech from the Local Authority will be quite detailed as they need to very clearly explain their actions. You will inevitably hear things that you don’t agree with, you may hear things you think are lies, or exaggerations and you will probably want to react and respond there and then. 1. Care proceedings are the battle of your life. You have to show strength and resilience that you never knew you had, and you must show it again and again and again. It’s like anything that is emotionally draining – if you do not develop a coping strategy (see below), you will burn out extremely quickly. If you react and respond explosively every time you hear something you don’t agree with, or that hurts, you will burn out extremely quickly. Think marathon, not sprint. The benefit to this is that it will very positively impact upon your parenting because when you learn how to cope in such high-stress, traumatic situations such as these, you also learn not to “sweat the small stuff”. 2. Your actions and reactions are being watched. This element of care proceedings cases really personally frustrates me, because you are under intense, incredible pressure so naturally that’s going to have an impact on you – but you are undoubtedly judged on the way in which you conduct yourself throughout. It shouldn’t be like that, but it is. If you react aggressively, or you are emotional to the extreme, it will be used as evidence against you. These are some of the things I used, and I know of other people using, to have got through this difficult part of the process. One, some or all of these may help you during hearings. It is awful to hear bad things about you being said out loud. It is even more awful when they relate to your parenting or your children. It is even more awful when you know you can’t respond, particularly when you’re probably pretty angry with the ones who are saying it. However. Try to think of it like this… The court is a theatre. The actors are playing to the audience, which is the Judge. There will be some dramatic language used to make their points, that doesn’t necessarily mean it’s true. Making an application for a care order, or whatever order they are going for, is taken very seriously by the court, and Local Authorities would be in pretty hot water if they didn’t have a good reason for doing it. So remember that when they are explaining their case, they are also justifying their actions. Don’t forget, there needs to be solid evidence for a Judge to make an Order. His or her head won’t be turned by drama. So, let them have it, let it go. Don’t let what they are saying get to you. Keep this key word in your mind: evidence. It is very natural that, when someone says bad things about you and your parenting, you want to prove them wrong in whatever way you can. However, try to remember this: the Local Authority have their plan, and they will say things that will back up that plan. But, by the same token; you have your plan, and your barrister will say things to back up your plan. This is something that was taught to me by an incredible lady who attended a meeting with me when the Local Authority were saying some terrible things about me. My whole body was itching to respond, but this lady just kept saying quietly to me: “they have their plan, and we have ours”. I can’t tell you how much it helped. So, try to remember that when you are having to listen to these difficult things. It takes around six years to qualify as a barrister. That’s a hell of a commitment and a very long time spent learning about the law. As such, your barrister is very well placed to not only advise you, but conduct your case to their best of their ability. Trust them to do this especially when you are hearing very difficult things and you want to object to them, or respond in some way. Write your barrister a note and trust that they will know when is best to raise your points. Most of the barristers that I have met have been absolutely dedicated to their client – my own most certainly was. They’re also not naive; they know the system is flawed and many of them are trying very hard to change that (organisations such as The Transparency Project, for example). b) you are the expert in the subject of your own life, but be mindful that they are the experts in the field of law. If you’re are not confident about your barrister, discuss this with your solicitor. It might be that they can talk to the barrister about why you are unhappy, or it could be that if the trust is gone, you are able to instruct a new one. Remember to control your breathing when times get tough. As I said in my previous post, a good way to do this to to inhale through your nose, pause for a second and blow your breath out of your cheeks. This might sound a bit silly and maybe simple, but under pressure such as this, you’d be amazed at what you forget to do. I couldn’t have told you my name at some points of my proceedings. Water – obviously! Although, you’d be forgiven for wanting something stronger, quite frankly. Court hearings are very draining, the buildings can be hot and stuffy, and it’s important to keep yourself hydrated. It also provides a useful focus in my experience. Whilst you cannot eat during a hearing (I wouldn’t advise chewing gum either, out of respect), you must try to eat a little before you go in in the morning, or if you are there all day, during breaks. I was very lucky during my proceedings to have people with me who would remind me to eat, and I will be forever grateful as it fuelled me to keep going physically when emotionally I felt I couldn’t. All of the above are free and have far more brilliant advice on them I could ever fit in here. ii) A good bedtime routine. Whether that’s a bath, a book or a warm drink, think how much better children sleep when they’re in a routine and translate that to yourself. As I said above, it’s a very good idea to take a notebook and pen into court to communicate with your barrister. However, it can help some people to take notes during the hearing on what is being said. It can provide a focal point if things get heated or intense, or what you are hearing is particularly painful. These are some hints and tips that may help you through a hearing. Above all else though, keep in mind why you’re there; your children. The desire to be with them, or keep them with you should be at the forefront of your mind at all times. Remember why you’re fighting – for your family. Remember the bigger picture. Lastly, I wanted to give you a few tips on how to give the best evidence you can. I remember very clearly during the Final Hearing of my Proceedings when I first took the witness stand, the Judge turning to me and telling me that this would be the single most important piece of evidence in the whole trial and to try to relax. Thanks Judge (!). What’s that saying…”fail to prepare and prepare to fail”..? Well, it’s not a bad sentiment in this case. If you know that you are going to be giving evidence, you need to try and take some time out to think about exactly what it is that you want to get across. Think very carefully about what it is that the LA are saying; what is their argument? And then prepare your defence to that argument. When you have spare moments, think again about the key points in your argument and how you would get them across to the Judge. Sometimes, when you are under intense amounts of pressure, it can truly affect every part of you, including your memory! So, one thing that I personally found useful was to sit quietly for 20 minutes before I was due to go back into court and give evidence and reread my final statement to court. I asked my barrister and everyone else to leave me alone (in the nicest possible way!) and just sat and absorbed what I had written only a few weeks before. Initially it was like someone else had written it; I couldn’t remember a thing, but the more I read, the more I remembered and the more it made sense. So I would be inclined to do something like this if you can, just to refresh your memory. Your solicitor and barrister have almost certainly been through a parent giving evidence before and will have a good idea of what to expect. In the weeks leading up to you giving evidence, listen to them, ask as many questions as you can and take notes of their answers. If there are particular areas you’re frightened about, or not confident, focus on these as they’ll certainly come up and you need to be as prepared as possible. Lean on your legal team for this part – that’s what they’re paid for. You might be worried about aspects of your case and that if you are asked about them and give an honest answer, you might lose your children. For example, if your child has suffered harm or neglect and you know deep down you could have done more to protect them against that harm – it is always better to say so. In fact, you might be surprised; it is more likely to go in your favour than against you as it shows you’re willing to take responsibility and you’re able to be honest. I know how difficult it is to do this, but the more you do it, the easier it becomes in my experience, and it’s actually quite liberating in the end. It is the Local Authority’s (or Children’s Guardian’s) job to put to you difficult questions. Some barristers do that in a careful way and are mindful of not making the process any more unpleasant or upsetting for you…and some barristers just don’t and will ask difficult questions to get a reaction (sorry to my legal followers but we all know it’s true). These barristers will push your buttons and this is your time to rise above it, keep calm and quiet and answer their difficult questions with grace and dignity. Have that as your mindset from the beginning, know that difficult questions will come up and welcome them as an opportunity to show that you are not interested in an argument with anyone, you just want to make your points, that’s all. Try to remember that for the barristers, this is not personal. They are just doing their jobs. So let them do it. It’s a learning curve, but you could ask your barrister, your solicitor or any of your friends and family to “role-play” with you in the weeks leading up to you giving evidence. When you are asked a question, think about your answer before you open your mouth. Think about exactly what the barrister is asking you, and only answer that question, clearly and concisely. It is likely that whoever has asked you the question will wait after you have finished your answer and simply look at you. This is a tactic used to try to get you to feel awkward and then start talking more and hopefully trip yourself up! It’s not something that’s exclusive to barristers, employers do it when interviewing, the Police are known to do it in interviews, and politicians are subjected to it daily – so don’t take it personally. Answer the question that has been asked of you and no more. This changes the dynamic and puts the ball firmly back in the other person’s court (excuse the pun…). For example; if someone asks you how old you are, you would answer “21” (if you’re lucky). If a silence follows, you would probably feel awkward wouldn’t you? You would think that asker was perhaps judging you, and it’s human nature to avoid that by filling the silence. However, if you were to keep quiet, the asker would almost certainly start speaking first as they would themselves feel awkward. So, try to remember that! What are the key points of the LA’s case and how can you answer them? I hope this post helps those of you attending court, and perhaps giving evidence. These are simple strategies I myself used to great success. I wish you well with them, and I wish you well with “surviving court”. After well over three years, my sixth – and hopefully final – set of Proceedings in the Family Court came to an end last week. There were times over the last three years I thought it would never be over, times I thought I simply wouldn’t survive. But I did, and I have, and I hope I can help other parents to survive, too. As I walked into Court last week, I was reminded of how it felt to attend my first Hearing, that I didn’t know what to expect, where to sit, when to speak, why I wasn’t allowed to respond when the Local Authority said upsetting things about me to the Judge. It was like an alien world where everybody spoke another language and knew the etiquette; I was a stranger in a foreign land. As such, I wanted to write a “Guide To Surviving Court” to try and give some practical advice to parents who are facing Proceedings and perhaps feeling that same rising panic in their throats as I once felt. I’m splitting this into two parts; the first dealing with the practical issues of attending Court, the second dealing with what actually goes on in front of a Judge. I hope that this may help parents to feel a little less afraid, a little less confused and bewildered, and a little less alone. The first, and possibly most valuable piece of advice I can give parents is to find a good,reputable legal representative. The first starting point I would use would be The Law Society’s “Find a Solicitor” page here – scroll down to Family and relationships in th e “Legal Issue” box, input your postcode and up should pop a list of local solicitors. Look for the icon to the right which shows that the solicitor is accredited by the Law Society Children’s Accreditation Scheme. If you struggle with the internet you can also ring the Law Society on 020 7320 5650. I would always advise you to research your solicitor as much as you can; recommendations, word of mouth and a Google search all help, but most solicitors will be prepared to meet with you for around 30 minutes either face to face, over the telephone, or by email. I can’t emphasise enough how important it is to get the right advice. In my own case, after sacking my first legal team, I went out of the area and chose a national firm specialising in Care Proceedings. This turned out to be a very wise move and I’m not sure I would have had the outcome I did otherwise. NB Often you are represented at Hearings by a barrister and you may not have ever met this person as you will ordinarily deal day-to-day with your solicitor. This can mean that when it comes to the day of the Hearing, you’re not sure who to look for. 1. Google the name of your barrister as often Chambers ensure up-to-date images of their staff are kept in the public domain. Input (for example) ‘John Smith Barrister Liverpool’, and click on images. 2. Approach the Court Clerks and ask if they know who this person is. As barristers are in and out of Court daily, it is likely someone will be able to point them out. Once you’ve found your solicitor, it’s time to prepare for Court. It’s very possible that you’ve never set foot inside a Court building before, you might not even be sure where your Court is. A good place to start is here at the Court and Tribunal Finder. You enter your postcode and your nearest Court(s) are listed. Once you’ve found your Court, it’s a good idea to plan, in advance, how to get there. If you don’t drive you can try this link – this is Traveline and it’s a journey planner for the UK.You simply input your postcode, the postcode of where you want to travel and the time and date and a complete journey from door-to-door is displayed for you. I’m sure no one needs to be reminded that Court is serious business. Even though it is probable you won’t actually speak to the Judge, he or she will certainly be aware of your presence, so it’s very important to make a good impression. It also helps you mentally, in my experience – if you’re dressed smartly, you hold yourself differently. It might be a small thing, but every little helps. Men: You don’t need a three-piece suit! Just some smart trousers or chinos, a smart shirt and shoes (not trainers) will help you to hold yourself with confidence. Women: Dress pants, or a skirt with a smart top work well. Remember to keep necklines high and hemlines low! It’s very important that you’re comfortable, too. You’re likely to be there for quite some time, so wear something that isn’t going to irritate you. I can’t wear heels myself – I can’t walk in them at all – so whilst I was always very smartly dressed for Court, I would wear flat shoes. It sounds daft, but you need to be completely focused on what’s going on – not that waistband digging in, or your feet bunched into tight shoes. Courts seem often to have their own climate – either freezing or boiling! – so I’d advise you wear layers. I cannot emphasise enough how important it is to have good support around you during the child protection process. Whether you are part of a couple, or a single mum or dad; you will need a strong network of support and this is extremely important when you attend Court. Unless you are a “Party to Proceedings” (see my Glossary here), you will not be allowed to enter the Courtroom itself, but just having someone with you in the waiting area will help so much. There is an awful lot of ‘waiting around’ during these Hearings; sometimes emergency matters come up that the Judge must deal with first, and it is quite normal for your case to be listed at the same time as two or three others. I’ll be honest with you – the waiting is the worst part. When considering who could attend with you, think about what you will need. In my experience, you need someone with you who is level-headed, quiet and calm. If you think your mum will end up more stressed than you – leave her at home! What you really need is someone just there to listen, without judgement, and to hold your hand and carry your pain. Independent advocacy services are – unfortunately – very very rare for this type of situation, but charities such as Families In Care (based in the North-East) and the Family Rights Group (based in London) work immensely hard to support parents faced with the child protection process. Whilst this doesn’t mean that you need to take every document you’ve ever received from the Local Authority, it is a good idea to take anything you think might help your barrister or solicitor. So, if there has been a recent review meeting, or care-team meeting and you have any reports or minutes, do take them along. It’s a very good idea to purchase a lever-arch file for this purpose. Not only does it keep everything in one place so you can easily find important information, but it also helps you to feel like you’re doing something in the darker days. As I already mentioned, there is an awful lot of waiting around when you attend Court. For example, at one of my recent Hearings, I arrived at 9.15am, and didn’t leave until 1.30pm – and that’s reasonably normal. The waiting can be very difficult, so I would advise you take some things with you to pass the time. A magazine, a book (or a Kindle), a puzzle book – anything that’s quiet and will focus your mind. I would definitely advise you take a bottle of water with you, or a cool drink of some sort. Just bear in mind that glass bottles are likely to be taken by security staff as they can’t be taken into the Courtroom. Some Courts have a small cafe, others just a tea machine – either way make sure you have some change to get yourself a cuppa. It’s amazing how much a hot cup of tea made me feel better during my Proceedings! I would also advise you take a snack, some fruit, or nuts, a cereal bar, or some chocolate – Court is draining and you need to keep your energy up. Just remember not to eat in the Courtroom itself! Other things I would always have with me would be tissues, mints, a pen and some paper, some paracetamol and Bach’s Rescue Remedy (click here for more information) which helped me to stay calm. I also always took a small picture of my children with me to remind me to stay strong. As you enter the Court building itself, you will need to pass through a security scanner and then a security guard will use a manual scanner too. This can feel a bit uncomfortable but it’s essential to keep everybody safe, and you’ll see yourself that solicitors and barristers have to be scanned, too. It’s very likely that your bag will be searched as you pass through the security scanner – again everyone has to go through this. If you have anything glass in your bag, like a perfume bottle, it’s likely it will be confiscated until you’re ready to leave Court. You’ll be given a receipt for it though and can pick it up on your way out. Anything that could be potentially used as a weapon will also be taken, and in my experience things like chargers are often taken. However, if there’s something you have with you you really need, explain this to the security guard who will use their discretion. For example, I used to have to take my hospital-grade breastpump to Court, along with ice packs and a cool bag – I got a few raised eyebrows the first time I took them in, but the security staff allowed me to take them in with me. It actually became a running joke after that! The waiting area in Court is particularly bizarre. There is normally a main waiting area, and then lots of little rooms where barristers and solicitors take their clients ahead of Hearings. In my experience, it is somewhat of a coup to get one of the little rooms – and if you get one, you hold onto it! If you are in the main waiting area, you will likely hear and see a lot of human emotion. Court is a stressful business – people’s lives are being decided, so don’t be surprised to see people upset. Unfortunately, it is likely you will also hear snippets of conversation from other people cases. This is always uncomfortable, but sometimes can’t be helped. Try to remember that everyone there is nervous – sometimes even the lawyers! Just keep your head together and focus on your own case and why you’re there. Eyes on the prize, as someone once said to me. One of the things I found extremely hard to deal with was when the “Advocates” (which will likely be your barrister or solicitor, the Local Authority’s barrister, the Social Worker, the Children’s Guardian and their barrister) all disappeared off into one of the little rooms together for Pre-Hearing discussions. Very often these people work together every day and so know each other quite well – very often they will therefore have a joke and a chatter before getting down to work. In any sort of work environment this is quite normal, but for a parent, this is incredibly difficult to see. Very often, you are left alone outside of the room, knowing that the Advocates are discussing your child and your life, and there’s nothing you can do. I know of parents where this has been too much, and they have burst into the room, or caused a fuss demanding to be allowed to sit in and know what is being said. I can’t emphasise enough how important it is to keep your cool during times like these as any behaviour like that will go against you. You must try and stay calm and keep your head “in the game”.- Breathing. Focus on your breathing. In through your nose, pause, out through your mouth. Concentrate on the rhythm of your breath and with each breath allow yourself to relax. – Keep busy. If you have someone with you for support, talk to them. If you’re on your own, read your magazine/book, or find something on your phone to keep you occupied – I used to play solitaire over and over (I was very bad at it) as it was mind-numbing. – If it gets too much, get up and walk. Stretch your legs, walk from one end of the waiting area to the next. Count how many steps it takes you. Another trick is to count back from 100 in sevens. I’m not quite sure how that helps, but I used it and it worked for me. Start with 100, minus seven to get 93, and then minus another seven and so on. If you smoke, go and have one. Or five, go and have five. I’m not a smoker (I actually quit during my newborn’s Proceedings believe it or not! ), and I obviously don’t normally advocate smoking, but this is not a normal situation. Do whatever you have to do to get you through, within reason. If that’s five Malboro in a row, so be it. Keep calm, and remember why you’re there. Keep your children in mind all of the time. You can do this, you will get through this. This too will pass. I hope this helps some parents to prepare in their own way for Court. Part Two of this Post will deal with what to expect in front of the Judge, and how best to get through an actual Hearing, including some advice on how to give evidence. The Proceedings are over. Like me, you’ve survived. Either the Local Authority have agreed to rehabilitation home, or you endured a Final Hearing, fought your guts out and won your case. Either way, the child you’ve been fighting for comes home. Unfortunately, this is the part that no one tells you about. Around 2012/13 – when Baby B was taken – the chances of having a young child (or a newborn baby) that had been removed from a parent’s care, placed for non-consensual adoption seemed to be getting higher and higher. Newspapers were full of statistics that showed more children were being adopted, rather than left to “languish” in the system. Most people agreed; no one wants to see children left in foster care and so this was a good thing. Except, of course, if you were a birth parent. From a birth parent’s point of view, if you were in public law proceedings, it didn’t bode well. “Adoption is the ‘last resort’. The starting point must be consideration of the law around Article 8 of the European Convention and the fact that this imposes a positive obligation upon States to try to keep families together. The least interventionist approach is to be preferred. The child’s interests are paramount, but the court must never lost sight of the fact that these interests include being brought up by his/her natural family. There must be proper evidence from the LA and the Guardian that addresses all options which are realistically possible and must contain an analysis of the arguments for and against each option. The court then ‘must’ consider all available realistic options when coming to a decision. The court’s assessment of the parents’ capacity to care for the child should include consideration of what support was available to help them do so. The LA cannot press for a more drastic form of order because it is unable or unwilling to support a less interventionist form of order; it is their obligation to make the court order work. During my case, even as a lay-person, reading about Re BS on a family law blog I had discovered aptly named “suesspiciousminds”, I understood the significance of it. In fact, after submitting their Final Evidence, the Judge in our case told the LA to “go away and do it again”, as they had failed to explore all of the realistic placement options, nor had they performed a balancing exercise on the pros and cons of each. I remember sitting in that Hearing thinking that I was literally watching the law in action. Were the stakes not quite so high, I would have been fascinated! I can tell you for certain that Re BS was key in my mind when I wrote my final Statement to Court, and I’m sure that it had an impact on Baby B’s return home. These two cases (and a few before and after! ), have certainly changed the state of play somewhat. As a result, more parents are beginning to see their children returned home. More families are reunited, more families given the support they both need and deserve for their children to be raised safely. I think most people would agree; this is a good thing. No one wants to see children forcibly adopted if it can be safe for them to remain within their birth families. But what happens when your child comes home? The child you fought for…the “subject” of six months of Court hearings, meetings, reviews…a case number…the child you have seen only in a Contact Centre, watched over by a Local Authority Contact Supervisor, for maybe 2 hours three times a week…your child is now asleep upstairs in the bed that remained empty whilst you fought, in the bedroom you couldn’t bear to go into. It’s over. How do you even begin to process that? I can only tell you from my point of view, and the simplest answer is…you don’t. You just don’t, in the first instance. Ordinarily, a child will come home either under a Supervision Order (see my Glossary), or at the very least with some sort of Social Work involvement. I don’t think I know of anyone who has “escaped” at least a period of monitoring – which I suppose is both fair enough and to be expected. So, you will most likely spend a good 3-6 months in a permanent state of utter terror that “they” will come and take your child again. You become Mary Poppins – everything in your day and your life becomes about your child and you do it all with a big jazz-handed-Julie-Andrews-smile on your chops. You know what you’ve been through, and you then assume that your child has seen and felt that same trauma and horror, and so leaving them – even to go to the toilet – becomes an exercise in guilt in case they feel abandoned again. You babywear, you co-sleep, you never get a second to yourself. You become hyper-vigilant and panic over every bruise, scratch or fall your child has in case you have to go to the GP, or the hospital.. 18 months on for us and still every time Baby falls over (which, as a toddler, is a lot), I have a second of utter terror. When you go to baby clinic, or toddler groups, or the school yard you feel every eye on you and you think everyone knows. You panic when strangers admire your child in case they ask you a question about your child you don’t know the answer to. You second-guess yourself; your confidence as a parent is likely to be in the toilet after you’ve had a whole authority tell you you’re not good enough. You don’t feel able to make a decision about your child. The baby that they take is never the toddler that returns. This is trauma. This is what no one talks about. Because it should be rainbows and glitter and those jazz hands again shouldn’t it? Come on now – this is what you wanted, what you fought for! He/she’s home now…it’s over. Except it isn’t. And it won’t be for quite some time. The biggest and best advice I can give you? Don’t ever work towards “getting over it”, and don’t listen to anyone who tells you either to, or that “one day” you will. You will never “get over” this. Instead, work through your feelings towards acceptance. That’s all. Accept that this happened to you, your child, your family. Don’t fight it, you can’t change what’s passed. The best way to work through anything is to talk. I would strongly advise counselling to anyone having gone through this. Go and talk to your GP and ask for a referral to your practice counsellor – it’s free (although there is often a waiting list). If you have the financial means, look up local counsellors. A great resource for this is the BACP (British Association for Counselling and Psychotherapy). They have this page in which you can find a local, accredited counsellor. They’re there to help you and it is entirely understandable you will need support. On that note – support – although at first you may be scared, and it might take you a little while to feel confident enough, I would advise seeking as much support as you can around parenting. The remaining SureStart centres can be found here, many of them offer “stay and play” sessions (which will benefit both of you, enormously), and lots of activities for families to do together. They also have training courses, and many offer the free nursery places for 2 and 3 year olds (for more information on free nursery places, click here). Whether this is your first, or fourteenth child – we’re all learning all of the time. If your child is of school age when they come home to you, I would strongly advise fostering a good relationship with their school. Often, schools are a wonderful source of support for both parent and child – our schools have bent over backwards to help us over the years. It is likely the school will identify a “learning mentor” for your child – someone your child will get a bit of extra support from. This person will understand that you have been through trauma as a family and the more that you keep an open dialogue going with them, the better placed they are to be able to help you and your child. If your school doesn’t offer anything like that, I would advise you to be proactive and meet with the Head to ask for this provision. Shy bairns get nowt, as they say up North. Don’t push people away. Keep your family and your friends close to you. You might be sick of the sight of each other as they have no doubt supported you wholeheartedly through your proceedings – but keep the communication going. One of the only useful things my birth mother taught me was “no man is an island”, and this is true here. Don’t isolate yourself. No, the majority of people won’t understand (and to be honest unless you’ve been through this first hand you cannot hope to), but that doesn’t negate their advice, support, kindness and care. Some of my friends absolutely held me together in those early days of baby B’s return, often just with kindness, normally in the form of tea. Finally, give yourselves time. Time to adjust as a family, time to reconnect, time to bond again. There will be tears, there will be anger, there will be frustration…it isn’t all rainbows. But, just now and then, you will find one peeking out from behind a cloud. And on those days, hang on to it and know that, in time, everything will be ok.
A must-read post from a lady I have “met” on Twitter and who goes by the name of @suddenly_mummy to avoid identification. She is a foster carer giving her experienced point of view, and some truly invaluable advice to parents who have had their babies and toddlers removed. I’m really grateful to her for taking the time to do this and would urge any parent going through Proceedings to read. As a short-term and emergency foster carer of children aged 0-3, my home is often the first foster placement a child will experience. For the child’s parents, this is often their first experience of having a child in foster care too. Together, we must all navigate this strange, confusing and often frightening world. From early in the foster care placement, contact sessions can be enormously emotionally charged experiences for family members and children, both positive and negative. Can I give any useful advice to parents in this situation? I can only speak from my own experience and observations over the last four and a half years of fostering. I hope that I can share something that will be helpful. I’ll start by saying that I believe that contact is the first rung on the ladder for parents. Social workers will ask all kinds of things of parents, most of which the foster carer will not even know about, but attendance at contact is so, so important because it shows that the parent can do the hard thing in spite of everything, putting their children’s needs above their own. Even very young children – even tiny babies – feel the effects if contacts are missed. Unfortunately, contacts cannot always be arranged at a time that fits well with a little baby’s routine, and it’s hard on them to be woken from their nap, taken to a strange place, made to wait around for 15 minutes and then be taken away again. Feeds and naps are out of place, parent and baby miss vital bonding time, and parent misses out on an opportunity to care for their baby and keep up with their ever-changing needs and routines. The connection between them weakens, and there is the danger that the parent will feel (and appear) less and less confident about their ability to successfully care for the baby should they return home. At contacts, I can keep parents updated on their baby’s changing needs and the milestones they have achieved. I try to help parents anticipate upcoming milestones in the hope that they might have the slight chance of being the first to see their baby roll over, sit or stand during a contact. It is sad when this can’t happen due to missed contacts. With toddlers, it’s a different scenario. They soon learn that the door of the contact centre means Mummy and/or Daddy, so even if I don’t tell them where we are going, they work it out when we arrive. If I have to bring them home again without seeing anybody, they know it. Many times I have carried a toddler away while they have fought against me and screamed “Mummy! Mummy!” over and over again. It is very hard on the child. Children are often distressed at the end of contacts as they face their loss over and over again, but the distress at being given hope and seeing it dashed is worse. Over time, a sort of resigned acceptance sets in. The child begins to expect the let down, the disappointment, and no longer gets excited in advance of contacts. This is even sadder. While I have had my fair share of missed contacts, I know that most parents will move heaven and earth to get to see their children, even though the sessions can feel unnatural and sometimes distressing for everybody involved. When it comes to making contacts easier for a child, I am reluctant to tell birth parents what they should and shouldn’t do as each situation is so individual. Some things that happen at contact can be inconvenient for foster carers, but I wouldn’t necessarily say that parents shouldn’t do them. For instance, when a child comes away from contact with lots of sweets and presents and the other children at my home aren’t getting those things it can certainly cause some conflict! But that is for the foster carer to manage and I know that when parents bring gifts it is because they have been thinking about their child all week. But sometimes, things that are inconvenient for the foster carer can also be hard on the children. Lots of sweets, fizzy drinks and presents being brought to contact can make the whole thing feel like some sort of party for the child and they come away hyped up by it all, often bouncing off the walls for the rest of the day, and then feeling down for the next couple of days. Contact is the only opportunity for parents to treat their children, I know, but I also worry about the impression it gives to contact supervisors who are, as we know, making notes throughout. I have seen many a raised eyebrow from a contact supervisor over gifts like sugar dummies and massive bags of sweets. I can only imagine what goes in the notes. Perhaps instead of buying new things, parents might sometimes like to consider bringing items from home that may be significant for their child and help them to feel more settled. Nearly all the children I have cared for have arrived with only the clothes on their backs, losing all their teddies, comfort items, favourite toys, favourite clothes, etc. Of course we make sure they have what they need, but we can’t replace their familiar things. I would make a point of returning any items with the child if they were returning home at the end of the placement and, if they didn’t go home, they would be important memory box items for the child. It is sad to send a child to adoption without a single item from their lives with their birth parents to take with them. The relationship between the parents and the foster carer can be a difficult one, especially at the start. I wonder if it would help parents to know that, in my experience anyway, we foster carers have virtually no say in anything. We aren’t invited to most of the meetings and, although we attend LAC reviews and write reports for them, we hand the report in to the IRO at the review – it isn’t even taken into account before the meeting. I write a daily log that almost nobody ever looks at. I rarely hear about what goes on during contact. I am very rarely asked for my opinion on anything by a child’s social worker. All this is by way of saying that there is nothing to be lost for a parent in communicating as well as they can with the foster carer. We are not mini social workers. We don’t make any decisions about your child’s care plan and we are not there to assess or judge. I want to do the best job possible of caring for the children that come into my home. I really need the children’s family to communicate with me to help with this. I keep a communications book which I pass to the family members at every contact with information about what their child has been doing, any milestones achieved or notable moments. I find it helpful if parents write a few words in reply, if they have time. There often isn’t much opportunity to talk at contact handover times. Children need ‘permission’ from their family members to settle and relax in their foster home. This means that even if the adults are unsure about each other at the start, it is important that we all get along in front of the children. I understand that this is very hard for parents who may just desperately want their children home with them again, but it is a sacrifice that will make the whole situation easier on your children. On my part, I also have to show children my ‘approval’ of their parents and family, speaking respectfully about them and keeping positive about contacts. I try to build friendly relationships with parents so that children are spared any conflict of emotions, and so that the eventual transition back home can be as smooth as possible. In the past, I have supervised additional contacts in preparation for transition home for young children, supporting parents in taking on the care of the child, taking parents with me when shopping for a child’s first shoes. Foster carers will feel more confident in doing this if good relationships have already been established. In the interests of maintaining good relationships (and I know that there will be foster carers that can be hard to get on with! ), I think it’s helpful for a parent to come to terms early on with the fact that the foster carer will probably have a different style and different parenting priorities to theirs, simply because everyone is different. While a parent should always say something if they have a welfare or safeguarding concern, there are perhaps some issues that could best be left alone. I cared for a little girl whose Mum took delight in dressing her hair in elaborate styles and would say something negative about the way I had done her hair at nearly every contact handover which, over time, did cause a bit of tension between us. I knew that this child’s Mum just wanted to still feel like her Mum, despite her loss of control over everything, but it made handovers awkward for all of us, including her child. There are so many benefits for the children to maintaining a good relationship between parents and foster carers that adults on both sides sometimes just need to choose not to mention things unless absolutely necessary. Children should never hear the adults in their lives speaking critically about or towards each other. I am always aware of walking a line between supporting a parent in caring for their child, and patronising a parent, especially if the child is a tiny baby who has been removed very young. I would like to think that an inexperienced mum could talk to me about their child’s basic care needs but I know that this might be difficult, so if a foster carer is talking to an inexperienced mum about feeding or nappy changing I would hope the mum wouldn’t feel offended. The foster carer doesn’t mean to ‘take over’, but minor errors in basic care during contact will all be written down somewhere, and that could be avoided if the mum had a little advice. Normally a young mum’s own mum would do this, but most of the young mums I have met have had little or no constructive contact with their families and nobody to really help them. I would hate for an inexperienced mum to have a bad mark against her because she didn’t wind her child after feeding, or didn’t manage a soiled nappy very well or something, when really, she perhaps just needed to be shown. The assessments can sometimes be rather unforgiving. Some of what I have written here may not apply to your situation. Some may seem irrelevant. Some may seem obvious. But my first and last piece of advice to parents of children in foster care would be to turn up to contact. Every time. And if you really, really can’t make it, phone up in good time so that your child isn’t sitting in some featureless room waiting to be disappointed. Everything else can be sorted out as we go along. When you are a parent going through Child Protection Proceedings, you will do and say anything to have your children returned to you. The pain of separation is so great, it can be overwhelming at times. When my newborn was removed, I desperately searched the internet for advice, guidance, someone…anyone to listen. I was very vulnerable, as are all parents at these times, and regularly came across “Don’t speak to Social Workers”, “Don’t engage”, “Tape record everything” from people who had already lost their children. I was very lucky; I had a strong network of support around me and, with their help, was able to snorkel my way through the pool of bad advice found on the internet. I felt compelled to write this piece as an antidote to this, and in an attempt to offer parents another viewpoint from one who has been there, and successfully so. I am often asked by parents going through Proceedings how I succeeded in my newborn’s case. Unfortunately, not many of those parents are then willing to take on board the answer. The reality is, there is no “quick fix”. There is no magic wand, no one case law, no “freeman/common law” that is going to help to have your children returned to your care. I often see “admit nothing!” and I have to say, I cringe. Look at your behaviour. Yes, it’s very uncomfortable, and it hurts. But genuinely look at the way you have behaved and see if you are able to admit that you have been at fault and made mistakes. I don’t doubt that the LA have also made mistakes in your case, but forget that for a moment and look inwards. Identify the parts of your parenting that are not “good enough”. Be totally honest with yourself. This is not about anything other than your children, keep that in mind at all times. Only when you have identified your mistakes can you hope to accept them, put them right and change. I intend to expand on this particular issue in a later post, but for now, that really is the way I had my newborn returned to my care. I identified where I had been going wrong, and I worked my backside off to put it right. Yes, of course, there were other factors, but that was the main one. The bottom line is, if you maintain you have done “nothing wrong” (I hear that regularly), you almost certainly will lose your children. There is never an easy way for children to be removed from home. Whether it is by consent (where you sign a Section 20), or by force (by an Interim Care Order, Emergency Protection Order, or Police Protection), it is always distressing for everyone concerned. It is almost pointless to advise any parent on this, as – having been there myself – it is one of the most traumatic experiences of your life. However, I have heard advice that parents should tell children to resist Social Workers or Police Officers removing them from the care of their parents. I have to say, for the children’s sake, this is a very bad move. Put yourself in your children’s shoes; you are being removed from everything you know and made to live with people you’ve never met in a house you’ve never seen. I would say this – don’t make it any more difficult for your children than it already is. Stay as calm as possible (I know…I know), tell your children you love them very much, and make sure they have special toys with them – like a comforter or a teddy bear, a favourite book or a doll. If there’s time, give them a photograph of you all together to take with them. Above all, don’t make any promises, because at that stage, you don’t know when you’ll see them again, you don’t know when they’ll be home. Just tell them you love them and you will do whatever you need to do for them. If your children are currently in Foster Care, regardless of any Orders or lack thereof, it is likely they will be feeling upset, confused and anxious. Of course, they will miss you, as their parent, and of course they will want to be with you and come home. However, there is a difference between “want” and “need”. It is never advisable to encourage children to leave their Placement, unaccompanied and without warning and come to you. As much as it hurts, and I understand that pain more than anyone, children need consistency, and for the adults to take the lead. If your children do “turn up” unannounced, or contact you unexpectedly, I would always advise you, as their parent, let the Foster Carers and/or Social Workers know. One of my children turned up unannounced, having argued with their Foster Carer one day some time ago. I contacted the Foster Carer who was frantic with worry and about to ring the Police, reassured them my child was safe and made arrangements for the Carer to collect once I had sat with my child and talked through the reasons for their upset. It wasn’t that I didn’t want my child to stay, but that it wasn’t about what I wanted, but what was best. On similar lines, it is never advisable to turn up at your children’s school, or placement in an effort to see them. Whilst this might help you as their parent, it is very likely to cause upset and confusion for your child, and panic and concern amongst the professionals. I used to live for my contact days, and would have given anything for even just a glimpse outside of those strict times. However, I know that had I taken matters in to my own hands, all it would have done was provided the LA with more evidence that I could not prioritise my children over my own needs. If your children are in Foster Care, it is likely you will see them only at specified times and under supervision, by the LA, contact centre workers, or family members. Certainly my experience of contact supervised by the LA has been that everything of importance that is said is recorded, sometimes by a contact supervisor literally sitting with a notepad in front of you and your children. I can’t say that this is anything other than deeply unnatural and unpleasant, and many parents find it very difficult to attend contact as a result. I know at times, I really struggled to attend, not because I didn’t want to see my children, but solely because the pressure of being stared at and everything you say or do recorded and then picked over is extremely difficult to handle. At times, my children begged me to take them home. At times, my children sobbed and wailed and at other times they were very angry with me that I couldn’t just take them home. At times they asked very difficult questions: “why can’t we come home?”, “why are (three children) home and we aren’t?”, “why can’t we see you more?”. During one contact session, one of my children referred to themselves as “Council Property”, because they were in Care. These questions, these contact sessions, made me feel so angry with the LA and at times I had to fight my impulses to react, to say how much I hated my children being in Foster Care, that I was jealous of the Carers, that I felt the LA weren’t committed in any way to keeping my family together. The main reason I didn’t? Because I absolutely did not want my children to be any unhappier than they already were. I didn’t want them to feel divided loyalties, I didn’t want them to have to carry my pain at our separation as a burden. Yes, as an aside, the LA would have used anything I said as evidence I was prioritising my own feelings and needs over that of my children, but to be honest, that didn’t matter as much as making sure my children felt secure in their placement. I didn’t want them to be there, but we genuinely had no other option at the time, so what was I, as a Mother, to do? So. When you are in contact, and your children ask painful questions, think of them first and last and how your answer will affect them. Of course they need to know you miss them and you want them to be at home with you, but they also need to know it’s ok for them to feel secure and happy with their Foster Carers and that you support them. Vent to your family, your friends, your lawyer, but try your very best to be careful what you say to your children. If the Local Authority initiate Care Proceedings, you are automatically entitled to Legal Aid. This then allows you free legal advice and representation in Court. I have heard much advice on forgoing this representation and acting as Litigant In Person (LiP), and it is true that there are benefits to this. However, having acted in Person preparing Applications, Court bundles, statements and evidence, and having had a lawyer, I can tell you that it is significantly easier with a lawyer, than without. It is absolutely the case, in my experience anyway, that there are certain lawyers who will not work as hard for you, and others who will fight tooth and nail. It shouldn’t be like that, but it is. If you want representation: I would advise seeking out a lawyer either out of the area, or one who acts in the main for parents, or Guardians. If you want to act LiP: I would strongly advise using a Mackenzie Friend with a good reputation and reading Lucy Reed’s book “The Family Court Without A Lawyer”. Reading this Guest Post by Sarah Phillimore on how to get the best out of your lawyer will also help, in my humble opinion. If you are asked to sign a Section 20, or any kind of documentation at all, I would always advise having that documentation looked over first by a legal representative. When you sign such a document, you are told that you will retain 100% Parental Responsibility for your children, however, the reality is that you cannot realistically withdraw your consent thereafter and expect to have your children returned. Rightly so, the LA will want to see that the reason you signed in the first place is not going to be repeated. I have signed a Section 20 for two of my children before and, whilst it was entirely the right decision at the time and there was nothing else I could have done, I didn’t truly know the implications of what I was signing. Shortly after, the LA initiated Care Proceedings anyway, and what I found was that the S20 was used as a bit of a bargaining tool, if I withdrew my consent not only did the LA state they would apply for an Interim Care Order, but I was also advised by my lawyer that it would provide evidence that I was not cooperating with the LA. In conclusion, whilst sometimes there is no other option but a S20, I would advise thinking very carefully and getting some legal advice before you do so. This is a massively contentious issue and has been the subject of television documentaries and newspaper articles. It’s a difficult one for me, because I was in the position where I was pregnant, and in Proceedings with my other children. I was informed at an Initial Child Protection Conference at 8 months pregnant that the LA would be making an Application to Court to have my baby removed from my care at birth on a future risk of emotional harm. Of course I wanted to run, God did I not! I couldn’t bear the thought of them taking my baby. And certain quarters made it sound so easy! “Go to Ireland, get a house, have your baby, they can’t touch you, they’ll help keep your family together”. It did used to be like that but things have changed in Ireland as a result of 700+ families a year fleeing abroad to escape the Local Authorities. The Irish economy has suffered and it’s not as easy to make a life unless you have plenty of money and contacts over there who are willing to help you. The reality is, without those things, it’s highly possible you will get over there and have your baby taken anyway. I personally would never ever have been able to leave my other children in the UK and go abroad, though I genuinely did consider it out of absolute terror at one point. Of course, there are other countries you could go and there are families who have successfully relocated; you have to do what you think is best for you. I can completely relate to the fear and the want to run. I can’t advocate it, but I can understand it. I would always always advise staying and fighting. I know of cases where the family has relocated, and the concerns that the LA have had end up showing themselves, and sometimes children have been at risk, or have been harmed. Conversely, I know of cases where the family has fled, and been able to keep their children – only to lose them again when they return to the UK. I chose to stay and fight, knowing they would take my newborn. Would I have done that if I had plenty of money, contacts abroad and no other children? Honestly, I can’t be sure. In my time, I’ve heard all sorts of wild theories about “Experts” and a parent’s engagement with them during Proceedings. First of all, the term “Expert” can be attributed to many Professionals; a Psychiatrist, a Psychologist, a Medical Examiner to name a few. However, the Court also views the Social Worker as an “Expert”. Some camps feel that the input of a Expert Witness during Proceedings is invaluable as they are independent and have nothing to gain regardless of their viewpoint. Other camps feel that, as Experts are paid quite well for their input into Proceedings, it makes sense for that Expert to support the LA’s position, as that would then lead to them being instructed again. It appears true that there are “professional witnesses”, and it seems it can be a lucrative career. So, what does that mean for a parent going through Proceedings? On the one hand, you would be forgiven for wondering the point in engaging, if the Expert is a potential “professional witness”. On the other hand, what do you have to lose? One of the worst things that could ever happen to you has already happened, your children have been taken, surely you would do anything possible to have them returned? My advice would always be to engage as much as possible with any and all Professionals. Whether you like it or not, these are the people who will hold sway with the Court – don’t make it difficult for yourself. Suesspiciousminds says in “what should you do if social services steal your children” never to underestimate the power of being likeable. That doesn’t mean you shouldn’t challenge where necessary and appropriate, but it does mean that you might need to grit your teeth and make nice with the very people you know may stop your children coming home. A big ask, I know. Every time you want to lose it with these people, keep in the forefront of your mind that you are doing this for your children. If you’re asked to engage in Therapy, or counselling, or complete assessments, or courses – do them. Don’t even hesitate. Some people advise recording interactions with social workers and I have mixed feelings on this one. Part of me thinks that there is no reason why we shouldn’t record meetings, conferences, even telephone calls; if the social work practice is good then the social worker’s should have no issue with it. However, I do worry that it perpetuates the adversarial dynamic, and the “us and them”. Louise Tickle, a freelance journalist, has investigated this issue and I would advise you to read her article here. I would also advise you to read The Transparency Project’s guidance on recording meetings with social workers here. What I would finally advise is to take a notebook and pen to every meeting and take notes as you’re going. It’s also useful, where possible, to have an advocate, support worker, family member or friend with you at these meetings who are also prepared to take notes, particularly where there are emotive issues being discussed. I would also advise that you keep a notepad next to your phone and don’t be afraid to ask the Social Worker to pause whilst you jot something down. It’s a very good idea to keep a daily journal of anything and everything during Proceedings. Keep a record of appointments, meetings and Hearings and what occurred when they are over. This can also help to give you a daily focus and will be invaluable when it comes to statements and Final Hearing. If you suspect a child is being abused, physically, emotionally, or sexually, it is always best to pass that information to professionals. Similarly, if you are a victim of domestic abuse, it is always best to seek help. There are a wealth of local and national organisations there to help. As a survivor of both, I can promise you that, as a child, all I wanted was protection. It does not automatically follow that you will lose your children to foster care. It is our duty and responsibility to ensure the next generation are safeguarded and protected. What you need to be able to demonstrate to the LA and the Court, is that you can safeguard and protect your child. Keeping it quiet to avoid LA involvement is not going to help. Whilst I can’t promise that following these rules will ensure the safe return of your children, I can tell you that following this advice will be doing something productive to bring your children home. Care Proceedings are the fight of you life, so fight well. Surviving Safeguarding…or There And Back Again. I want to tell my story, in an effort to explain why I have chosen to write this Blog. It’s not a pleasant or an easy tale to tell. What I have been through in so many ways defines me, which, when you read my story, is very sad. But it is because it defines me that I want to tell you and…well…this is me. The nature of the matter, and the fact that I, and my children have been subject to public law proceedings requires me to anonymise my story. As such, there are parts that might read a bit strange. For example, I use “my child” and gender neutral vocabulary at times, and my grammar has (toe-curlingly) had to take a back seat. I have also added (in brackets and italics) explanations of terms used within the Child Protection process. But, other than that, my story is verbatim. This story is my life, and all that I am. I am happy to answer any questions, where I can, or take any comments on the chin. I’ve always tried to be a good mother, that I know, but my mental health hasn’t always been stable as a result of a very traumatic childhood. I was physically, sexually and emotionally abused by my biological Father, and neglected and disregarded by my Mother, causing me to spend time within the care system. This had the consequence that I was drawn to abusive and inappropriate relationships with men, whilst desperately searching for love, acceptance and a family. As such, I had a number of children by a number of Fathers, most of whom abandoned us. Admittedly, I have made mistakes throughout my life and on reflection, I have let my children down at times by prioritising abusive relationships over them. I have always struggled with my mental health as a result of my abuse as a child which has also impacted on my children. I have had two breakdowns in my life and my mental health has been acute at others. My first breakdown in 2007, during an emotionally abusive relationship, resulted in me approaching the LA for help as I had no family I felt the children would be safe with. My children were accommodated under a Section 20 (a voluntary placement with foster carers where a parent retains 100% Parental Responsibility) for around three months, during which the LA were relatively supportive and helpful. My children were returned under a Child Protection Plan (an agreement with the LA to adhere to certain requirements, such as unplanned visits by Social Workers, in order to ensure the children and parents are safe and well) and within six months the case was closed. In 2010, one of my children was diagnosed with a condition that explained their meltdowns and increasingly frightening behaviours. My child requested to go in to LA care of their own volition, no longer feeling able to live in a family unit. I missed my child desperately and saw it as a rejection, but had no choice other than to accept it. Once again, the LA were reasonably supportive and helpful. I then got into another abusive relationship in 2011, my mental health having spiralled after my child had left home. I was very vulnerable and the relationship ultimately turned violent. My mental health was so acute at that point that I truly felt the children would be better off without me and I took a massive overdose. I made arrangements for the children to be collected from school, but did not think about the rest of their lives. I could absent myself from responsibility and say that it was because I was so mentally ill. Yes, I was, but my behaviour was not that of a mother and I am truly ashamed I took that course of action. I should have thought of my children first and last. I asked the LA for help at that point once again, having left the relationship and got to a refuge. The LA helped with my children, but the dynamic changed and they wouldn’t permit them to return to me. They said they feared I would engage in another inappropriate relationship in the future and subsequently have another breakdown. They said “future risk of emotional harm” and issued proceedings. I understand entirely now why they took that course of action, but at the time I was in absolute despair, screaming inside for my children, and sharply plummeting into self-destruct. It had become a “battle” with the LA. No longer were they ‘supportive’ and ‘helpful’, but invincible and indomitable. A Psychiatric Report and a Psychological Report (these are commonly commissioned during Child Protection Proceedings to provide evidence to the Court) both stated I needed two years of Therapy. My solicitor told me to face facts, it was hopeless. I felt crushed, lost, alone. I had been a mother since my mid-teens – who was I without my children? They were all I knew. I continued to make poor choices and fell pregnant once again during the Proceedings. I knew the LA could try to take my unborn baby so battled with a termination. I was booked in at 11 weeks. I couldn’t do it. The Proceedings concluded at the IRH (Issues Resolution Hearing – the “last chance” for everyone to agree before a contested Final Hearing), my eldest, being ‘of age’, came home to me and it was agreed my child who had left home of their own volition would stay under a Section 20 with unlimited, unsupervised contact (as I was in agreement). Two children stayed in Long Term Foster Care under a full non-contested Care Order (this means the LA share Parental Responsibility with parents, but the LA have the ultimate say in important decisions such as schooling etc) but with weekly, supervised contact (it is normal to have supervised contact when children are in Foster Care however the frequency is normally 6 times per year). This was devastating for us all, but agreeing to the Order safeguarded my contact. Another child stayed with their Father under a Residence Order – now known as a Child Arrangement Order – but with daily contact. Mere days after Proceedings ended, my ex-partner absconded with this child and cut all contact. I had to issue private law (contact) proceedings as Litigant in Person (representing myself, no lawyer) at seven months pregnant, answering wild accusations made by my ex-partner. The LA then used these accusations, as well as my history, as evidence I wasn’t stable. I was told the LA would try to take my baby at birth and have him or her adopted in case I ever got into another abusive relationship, or suffered another mental health issue. I was advised to flee the country by John Hemmings (then an MP) and Ian Josephs. “Go to Ireland”. I nearly did. But I couldn’t leave my other children. So I stayed here, with my due date growing closer each day – in the full knowledge that going into labour sparked the end and that I could lose my baby forever. I gave birth to my baby after a horrific labour, and the LA issued Proceedings shortly after. We were forced to remain in hospital, neither of us permitted to leave. Despite LA submitting in court there was no immediate risk of harm (in theory, for a baby to be removed there usually has to be an immediate risk of harm, as in death, but in practice it doesn’t often work like that), once I read the Case Summary, I knew it was over. I was put on the stand, just a few days postnatal, hardly able to walk, bleeding heavily, leaking breast milk and made to fight. I did my best but I was so traumatised and terrified. I met the Children’s Guardian (they represent the child in Court and are independent) during the Hearing, I never stood a chance. The LA requested only once per week contact as they “didn’t want me to bond”; the Judge refused and gave me three times weekly. My baby was taken from me at a few days old out of my arms and from our hospital bed, on a “future risk of emotional harm”. I screamed when they took him. A guttural, primal scream. I left hospital with empty arms, an empty uterus, and a breast pump given to me by LA as I was still exclusively breastfeeding. I had never pumped before, having breastfed previously and had no idea what I was doing. I wasn’t allowed to see my baby for 3 days, and baby was put on formula against my wishes. The LA refused to transport my breast milk and I was told I could bring it to contact. I kept breastfeeding every contact and expressed 12 times per day, day and night, taking it to contact each time. It was like a death every time I had to leave my baby after contact, but I didn’t miss a single one offered to me. It was like I was grieving, whilst my child was still alive, all the time having to keep fighting. This was the very epitome of disenfranchised grief. But I kept going. I began the Therapy that had been recommended during Proceedings, and began counselling too. I read “What should you do if Social Services steal your children”, by suesspiciousminds and took every single scrap of advice given. The LA made applications for Care and Placement orders (a Placement order allows the LA to place the child for adoption against their parent’s wishes, this is known as Forced Adoption and we are one of a tiny number of countries in the world that allows this). My solicitor told me to give up; my child WOULD be adopted, it was hopeless. She told me to stop breastfeeding as it was making me ill. She told me to stop going to contact, to protect myself from the inevitable. When a newborn baby is taken at birth by a LA, the chances of having that baby returned to their parent’s care was 0.25%. I sacked her, found a solicitor who believed in me and I fought them, I fought all the way with every tiny bit of strength I had. I never backed down, never gave up, every time they battered me down, I got back up and kept going. The tide began to turn. The Guardian recommended rehabilitation home, my local MP took my case on and a local charity supporting parents through the child protection process – Families In Care – stood shoulder to shoulder with me, supporting me all the way. Eventually the LA were left standing completely alone as everyone fought alongside me for my child to come home. I turned my life around. In the days I didn’t have contacts, I attended therapy, counselling, domestic abuse courses, stress control courses, a relaxation technique course, confidence building, assertiveness training. I went to every contact offered to me for the children not in my care, I never missed one. I educated myself on the law, religiously read suesspiciousminds and pinktape and began to read Family Law Week and Bailii, scouring each for anything I could use. I also asked for advice on Mumsnet, and found some very experienced people willing to help and offer good advice. In short, I fought and fought and fought. I won my case for my child who had been taken away by their father, despite LA opposing all the way – advising the Court I should be given one hour a week in a contact centre supervised by them – and despite having no lawyer. I was given shared care; three nights and six days a week. The Judge in my baby’s case gave the LA chance after chance to back down. They wouldn’t and pursued a plan of adoption. In my view, their behaviour was increasingly hostile, their working practice sloppy, inefficient and narrow-minded. In one Hearing, the Judge told them the way they had treat me was “outrageous”, “unforgivable”, “beggared belief” and made it clear that an Application for an Independent Social Work Assessment would be very sympathetically heard (the reasoning behind this was that the LA were rigid in their thinking and would never give me a chance) . The Judge told me I was not only “good enough” but that I gave a “higher than average standard of parenting care” and that I was a “highly intelligent woman”. I finally felt listened to and respected. Shortly after that Hearing, the LA finally backed down, accepting a plan of rehabilitation under an Supervision Order (an Order that means parents retain 100% Parental Responsibility but means the LA MUST support, assist and befriend the family). 258 days after my baby was first taken, they were handed back to me in a car park and have not only been home now for over three years without issue but the Supervision Order expired in March 2015 and the case was closed. It could have been very different. I have completed the Therapy recommended during Proceedings, despite the LA stating they believed the prospect of my engagement looked “bleak”, and made huge progress. I am now more reflective, more mindful, quieter, and calmer. A Psychological Report in late 2015 stated I had “no mental health issues”. The same Psychologist who had originally diagnosed me told me I did not now meet the threshold for any mental health diagnosis. The LA continued to enforce supervised contact once per week with the two children who remain in long term foster care, despite having 3 children in my care and unsupervised, overnight access to another. The LAs reasoning was that, if I was unsupervised, I “may tell these two children that I want them to come home” which “may destabilise their placement”. The LA did not think how it may feel for my two children not to hear these words. That they may – as they now do – feel that I fought for their youngest siblings, but not for them. I duly issued Proceedings as LiP (Litigant in Person) in 2015 to bring their contact more in line with that of which their siblings enjoy. I also successfully applied for an ISW (Independent Social Work) assessment and the updating Psychological Assessment which provided me with evidence to support my application. This now marked my SIXTH set of Proceedings in under 3 years. I was granted unsupervised contact, at home, with my two children in long term foster care. It went beautifully well for a time. They both expressed a wish to come home. I issued Proceedings for a Discharge of the Care Order. During those Proceedings, oddly, they both changed their minds. I respected their wishes, and withdrew my application. One child then chose to come home, whilst the other stayed. You can read more about that here. It lasted four days. We both naively thought the desire to be together would be enough to make it work. We were fractured again, broken. It was hard. Both my children cut contact. I had to respect that, ensuring and reassuring the both via their social worker that my door was always open for them and I was always here for them. It was difficult not to put barriers up to protect myself; a natural and understandable reaction I think. I blamed and tortured myself. Unexpectedly, two months later, my child who I had a shared care arrangement with their father, came home to live with me full-time. Their father simply abandoned our child one day. This child has lived with me since September 2016 and will now stay with me until they are ready to leave home. One of the main people to help support me was my eldest son. One of the main things that helped me was writing my blog. I began training social workers, I began speaking at conferences. Terrifyingly, the media told my story (see Media section!). I wanted to make a difference. With balls of steel, I came off benefits and became self employed. I wrote for Community Care. I travelled, around one day a week, around our nation to help social workers to reconnect with their service users. My children were proud of me. I found, for the first time in my life, I felt worth something. I have a lot of reparatory work to do with all of my children, to put right what I previously did wrong. I still carry a lot of guilt, but it is a work in progress. I will never be able to forgive myself for my mistakes, but I can use them as fuel to ensure I am the best parent I can be, here and now. At the time, I never would have believed I would say this, but I am grateful for what I have been through. It was incredibly traumatic, and I still live that trauma each day, but it changed me for the better. It has made me a better Mum, a better person, and given me a willingness to believe in myself, trust myself, and – for the first time -like myself. Since first writing this piece, I have lost two members of my family to suicide; my eldest son on May the 27th 2017 and my ex-partner (who had previously abandoned our child) on August the 20th 2017. You can read the story of their deaths here. I have my two youngest children in my full-time care, children who wish to remain in foster care and one child at University. My eldest son lies in a grave I visit daily. Every single day I apologise for my failings. Every single day I vow to make his short life count for something. I intend, in time, to set up a Foundation for the elder siblings of children in care, a forgotten demographic. They need support and a voice too. I fight through every day, and I will keep fighting to fulfil my original aim; to bring social worker and service user closer together. There should be no “them and us”.